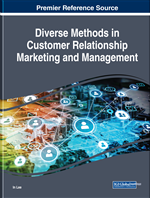 This chapter is based on an empirical research study that attempts to gain an understanding of the social customers' behavior by identifying the factors that influence their decision to participate in social customer relationship management (CRM) programs. A social behavioral model (SBM) was developed in this study. The construction of the SBM was partly based on two popular models: technology acceptance model and theory of planned behavior. The data (n=305) were analyzed with exploratory factor analysis, confirmatory factor analysis, and path analysis. Attitude, usefulness, and perceived risk are the most influential factors in SBM. Other variables—social identity, perceived ease of use, perceived behavioral control, perceived enjoyment, and satisfaction—affected intention indirectly. Subjective norm and image did not affect intention directly or indirectly; therefore, these two variables were dropped from the SBM. The resultant conceptual framework provides a stronger theoretical basis for understanding the behavioral aspect of social CRM implementation. Customer Relationship Management (CRM) has been considered to be “a basic building block of corporate success” (Rigby & Ledingham, 2004). To achieve CRM effectiveness in an organization, a firm should develop customer-focused learning and an interaction-oriented culture (Kumar & Ramani, 2006). The literature on CRM implementation identifies numerous factors that are keys to its success. Of these factors, customer participation, corporate culture, customer strategy, project management, and technical complexity are reported to be the most important. While each factor is critical to the success of a CRM implementation, this study focuses on customer participation toward a CRM program. Since the emergence of social media, its usage has increased exponentially, leading to a change in the CRM landscape. In this new era of social media, companies can no longer survive just by broadcasting their one-way advertising messages to customers without listening to their customers. Companies have begun to realize that they have to pay more attention to customers’ voices and change their strategy because social media has forced them to change the way they deal with customers. To confront this new reality, companies integrated social media into their existing CRM marketing strategy and renamed it “social CRM.” Therefore, the emergence of social media has changed the CRM landscape and has shifted the ownership of the customer-company relationship into the hands of the customer. This social CRM is not a replacement of traditional CRM; it is an extension of traditional CRM. Based on relationship marketing philosophy, social CRM aims to develop a customer-centric corporate strategy to deal with customers in a more transparent environment. It is also a key strategic tool that can help companies understand the concept of one-to-one relationship marketing. With a successful social CRM initiative, companies will know what to say to their customers and prospects, how to say it, where to say it, and when to say it in order to provide a more relevant customer interaction (Brito, 2011). Social CRM forces companies to shift the focus their customer strategies from customer acquisition to customer retention. The usage of CRM continues to grow in the industry at a staggering rate. Since 2011, each year around 70% of businesses have stated that they plan to increase spending on CRM in a consistent basis (CosmosCRM, 2016). According to market research firm Gartner, worldwide CRM implementation totaled $23.2 billion in 2014, up 13.3 percent from 20.4 billion in 2013; the CRM usage increased from 56% to 74% in 2015 (Gartner, 2015). Forecasts from Gartner anticipate that the CRM market will be worth $36.4 billion worldwide by 2017 (CosmosCRM, 2016). Despite this high volume investment in CRM, the success rate of CRM implementation is disappointing. CRM initiatives currently have a 63% fail rate and 53% of this failure is primarily due to the lack of clear understanding of customer insight (Direct Marketing News, 2013). Between 25% and 60% of CRM projects fail to meet expectations in the last decade (CosmosCRM, 2016). This created the need for companies to gain a deeper understanding of the factors that influence social customers’ intentions to participate in social CRM programs. In spite of such multibillion-dollar investments and the reported high failure rate, little empirical research has been conducted in this area (Bull, 2003). Since the customer-centric behavioral studies are underfocused areas of CRM research, this opens a door of opportunities for marketing researchers.